The deepest field of the regular season. One of the best college regular seasons in recent memory rises to a boil this weekend at Easterns, just outside of North Myrtle Beach in South Carolina. Although arriving slightly earlier on the calendar than in years past, this tournament marks the last chance for many of the best teams in the country to make an impression before the series, and is the best chance for teams on the bubble of strength bid contention to grab some valuable points in the rankings. With Centex taking a back seat this season and multiple mid-tier tournaments drawing the attention of top teams, this is one of the only chances we’ll get to see this much talent all in one place until Nationals. An absolutely loaded group of teams will descend on the fields this weekend, with a full 15 of the top 25 in attendance, including 7 of the top 8. The season has been building to this, with many intriguing questions and twisting plotlines waiting to be resolved this weekend. With the potential for big time rivalry showdowns, exciting rematches, and teams desperate for strength bids playing with their seasons on the line, there is a lot at stake. We’ve already seen some amazing games so far this season, but hopefully teams have been saving their best for last as we head down the home stretch into the post-season. With so much action happening all in one place, following it all can be a little disorienting. Amidst all of the potential story lines this weekend, here are a few story-lines we’re rooting for that could make the tournament memorable. One of the things that has made this season so exciting are the “mid-major” teams that are getting a chance to prove they belong at the adult’s table. This weekend we’ll get to see a few teams pounding on the gates of national recognition, most notably Missouri and Virginia Tech, who have the chance to really make a mark this weekend if they can string some wins together. An ambitious team, new to the spotlight, striving to break through and make Nationals for the first time; it’s one of the best narratives in the sport and if we’re lucky we’ll see it emerge this weekend. Just as the title race this year is wide open, the Player of the Year race also seems to be anyone’s game. This weekend should provide a spotlight for the division’s biggest stars needs to push themselves above their peers. Almost all of the big contenders for the award are here, with Jack Williams, Xavier Maxstadt, Jeff Babbitt, Trent Dillon, and John Stubbs all looking to carry their teams to an Easterns title, as well as some great players like Bobby Ley and Ben Jagt that could potentially springboard themselves up the list. One negative to this otherwise incredible season has been the conditions. It’s been rainy, windy, and chilly across many of the premier tournaments, most notably on Saturday at Stanford. There’s something to be said for seeing how teams handle adversity, but hopefully this weekend see what these elite teams can do when they get the chance to really open it up in amenable conditions. It’s the best rivalry in all of ultimate right now, and after the gem they played out last season in the final of this tournament, you’d have to be crazy to not want to see a rematch. With so many key figures in the rivalry graduating this season, it could be one of the last times we see some of these monumental players go toe-to-toe. With the series approaching, Easterns represents the highest stakes of any regular season tournament, as teams are scrambling to snap up the last few strength bids and round into form in time for the postseason. Some teams still need to prove their bona fides before we can call them legitimate title contenders, while others need to get younger players up to speed quickly if they hope to have the depth to make a run deep into May, and several teams may be playing for their seasons, needing to secure a bid if they want a realistic chance at making Nationals. Here are some of the big storylines coming out of each pool. 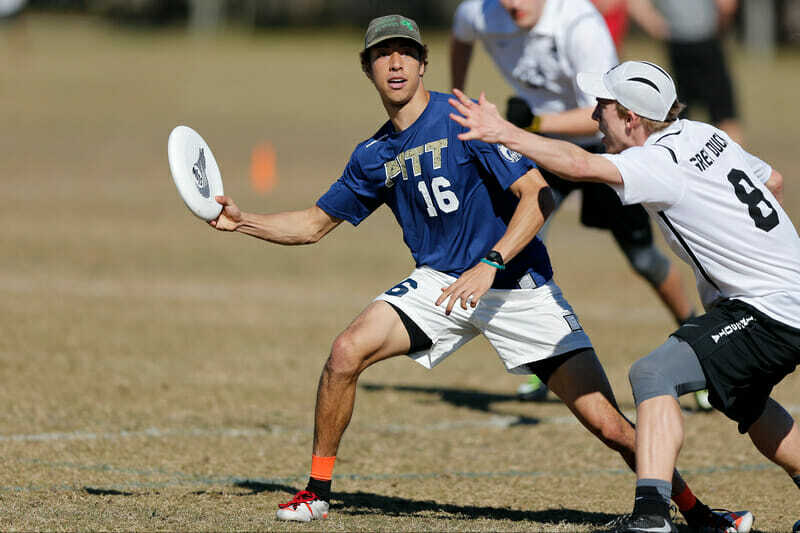 For the second straight year #2 Pittsburgh roll into Easterns as the top seed at the tournament, but with some question marks on their resume. In many ways, those questions are the same ones from last year: defense and mental focus. Pittsburgh’s defense has improved from where it was last season, but it still isn’t an elite unit by any means. If they can show some defensive grit this weekend, it will go a long way towards boosting their stock as title contenders. Coming away with another Easterns title would also put to rest some of the concerns of mental fragility following Trent Dillon’s shocking “Webbering” in the final of the Stanford Invite against Wisconsin. While Pittsburgh heads into Easterns looking similar to their 2015 predecessors, #9 North Carolina Darkside are coming at things from a very different angle this year. The defending national champions are in rebuilding mode, and they are trying to quickly get their glut of talented young players up to snuff before the series. Be on the lookout for freshman phenom Elijah Long who has gone somewhat under the radar this year, but could very well play himself right into the Freshman of the Year conversation with a good weekend. Winning would be nice for Darkside, but as long as their young players look like they are getting the hang of the team’s complex systems, they will likely consider the weekend a success. While Pitt and UNC may be secure on their roads to Nationals, Atlantic Coast upstart #22 Virginia Tech could likely be fighting for their lives this weekend. With North Carolina and Wilmington firmly perched atop the region, Virginia Tech are no doubt hoping to copy Maryland’s playbook from 2015 and ride a strong performance at Easterns to a third bid for the AC. If they can’t play their way into a bid this weekend, it could be curtains on their Nationals hopes. While #4 UNC Wilmington sit comfortably atop the pool, there are of several teams below them with plenty to prove. #10 Stanford Bloodthirsty have donned the mantle of best team in the Southwest, but this weekend should let us know whether they have it in them to do more. Is it just a year where they end their four year Nationals drought, or are they capable of shaking up the seemingly entrenched quarters and semis teams? They have yet to collect a marquee win this season, and were beaten handily at their home tournament by Wisconsin, UMass, and Oregon. If Stanford want to be considered a genuine threat to make quarters, they’ll have to show us something this weekend. Another legacy team looking for a return to Nationals is #21 Carleton. Expectations were sky high coming into 2016 for this distinguished program. While CUT is clearly loaded with young talent, the pieces just haven’t clicked in to place so far this year. They are still clinging to a strength bid for the moment, but their performances thus far have been less than convincing. With Wisconsin and Minnesota looking like behemoths in the North Central, Carleton will have to get some wins on the board to stay on track for a third bid, and to prove that they belong back at Nationals after last year’s absence. While Stanford and Carleton are programs looking to regain past glory, #17 Missouri is on the other end of the aspirational spectrum, in the hunt for their program’s first ever Nationals birth. On the back of Jay Froude, of Prairie Fire and Madison Radicals fame, Missouri swept through the field at Midwest Throwdown earlier in March to put them in line for a strength bid. That was JV competition though compared to the teams they will face this weekend. In its recent history, the South Central has been dominated by the troika of Colorado, Texas, and Texas A&M. This year is the first time there seems to be potential for some real shifts, and Easterns should give us a look at whether Missouri is just a flash in the pan, or the real deal — a team ready to upset the balance of power in their region. There is certainly no reason to panic for #3 Massachusetts, but their season hasn’t been the sort of blinding success some might have predicted after their dominant preseason. Falling in the finals of Queen City Tune Up and the semifinals of Stanford Invite to the two teams seeded ahead of them this weekend, Easterns represents a chance for this team to get a tournament win under their belts and some revenge for earlier losses in the process. The health of Jeff Babbitt will play an important factor for UMass, as he is still recovering from the head injury he suffered at Stanford that took him out of the game against Pittsburgh. Coach Tiina Booth described him as “day to day” at this point, but it’s an encouraging sign that he has been able to practice with the team this week down in South Carolina. Babbitt might be the best player in Pool C, but the most important player, at least in terms of value to his team, is Bobby Ley of #6 Florida. The POTY candidate is in his last year of college eligibility, and Florida will certainly look very different without him, as he has been a focal point of the team almost from the day he walked onto campus. After an impressive showing at Warm Up and a dominant Saturday at Tally Classic, Ley and Florida looked like they might be on the way to breaking into the top crust. However, they ran into Wilmington on Sunday and lost in quarters, meaning that Easterns will have to be their big coronation heading into the series if they want to snag a one seed at Nationals. After jumping into the spotlight with a convincing tournament win at Warm Up, #5 Minnesota has stayed out of the headlines, electing to not attend Stanford. Minnesota’s offense looked like one of the best in country down in Florida, particularly when they ran their devastating pull plays out of a side stack. With a host of throwback North Central athletes running and gunning past the competition, there was no question leaving Warm Up that Minnesota has the tools to put together a solid campaign this year. But how far can they go? We will likely get a good indication of that this weekend when they lock horns with some savvier competition. A game against a strong defensive team such as UMass, Wilmington, or UNC could be particularly revelatory, as Grey Duck never really saw their dominant offense get tested by a team that could concoct a tricky zone or poach look. If Minnesota can knock off one of those teams this weekend, they have to be considered a genuine title contender. It’s been a tail of two tournaments thus far for #7 Harvard. They looked downright mediocre for much of QCTU, finishing second in their pool and losing convincingly to Wilmington in quarters. A few weeks later at Stanford Invite, they rallied to a surprising semifinal appearance and notched some impressive wins. What makes it so tricky to tell which version of Harvard is the genuine article is that there are mitigating factors that affected both sets of results. At Queen City, flight delays got the team into Charlotte mere hours before their first game on Saturday morning and the team looked like sleep-deprived zombies, which may have explained some of their lethargic and sloppy play. At Stanford, while their finish was impressive, they could not have picked a better road to semis. In the bracket they squared off against Carleton and Oregon, two teams that play an almost ethereal, “speed over brawn” style of ultimate that is very similar to the tactics Harvard employs. Predicated on dynamic offense and picking their spots on defense to get breaks, these teams are looking to play smooth. By contrast, once Harvard played a team that had a physical, hard nosed D-line at their disposal, they crumbled. Wisconsin obliterated Red Line with their size and physicality to the tune of a 15-8 beat down. Another semis appearance this weekend, and victories over big, physical teams in pool play like Minnesota and Central Florida will go a long way towards proving that Harvard’s recent results were no fluke. But if they put up a lackluster showing like what they produced at Queen City, it will be hard to see this team doing much more than just making Nationals this season. Of course, just making Nationals is something that the rest of the teams in this pool can’t take for granted at this point in the year. #23 Georgia and Central Florida find themselves in a suddenly bid poor Southeast region. It appeared that Georgia had put themselves on the path to a strength bid with a strong finish at Queen City, knocking off Harvard, Maryland, and Michigan while playing close with UMass. However, close losses at Tally Classic set them back, and left them on the outside of the bid bubble looking in. One of Georgia’s biggest problems is that they tend to go on runs within games, going down by four and then ripping off a run of breaks to go up two. While this is certainly exciting for viewers, it isn’t an particularly sustainable way to play. They have been able to pull off some dramatic wins playing like this, but their margin of victory is often minuscule because they can’t hold on to leads. So while their overall W-L totals look pretty impressive, beating teams like George Washington by a only single point comes back to bite them when every rankings point matters. If Jojah wants to get another bid for the Southeast, not only will they have to notch some wins this weekend, they’ll have to do it in convincing fashion. A team that isn’t at all concerned with rankings is #20 UConn. The Metro East is unquestionably only getting one bid, so this team has one mission this year: beat Cornell at Regionals. An impressive fall and solid Warm Up (including a key win over Auburn) got them accepted to Easterns, now they get the chance to prove that they belong here with all these elite teams. Making the bracket would be huge, but just a respectable showing would do wonders for their confidence, and get them some reps in high pressure games before they see Cornell. Ultiworld will be live streaming games all weekend, and the announced slate of pool play games looks tantalizing. Games will be available live for free and after the tournament as a part of the Ultiworld Video Subscriptions. Here are some of the key players, matchups, and storylines to look for. 9:00 AM: Minnesota v. UCF – Some ultimate games are like rock-paper-scissors, with different styles contrasting in interesting ways. Some games are a contest to see who has a bigger rock. This game is decidedly the latter. Saturday kicks off with two big, physical, teams that love to shoot it deep and play high octane offense slugging it out. The Ben Jagt vs. Michael Fairley match up alone is worth the price of admission. After a disappointing start to the season, UCF will be looking to make a statement that they are still in the thick of things this year. Taking down the top seed in their pool would be a good start. 11:00 AM: UMass v. Colorado – This game should be an illuminating contrast in styles. Colorado is famous for its fastidious vert stack, so it will be interesting to see how they adapt to UMass’ zone defense. When these two squared off in pool play at Nationals last year, the UMass zone forced Colorado into a spread out attack that they were less comfortable with, and suckered Mamabird into engaging in a battle of deep shots. We’ll see if things are any different this season, or if that UMass zone is just too tough to crack. 1:00 PM: Georgia v. Harvard – A rematch from their collision back in February at QCTU, this game presents some of the best individual match ups we’ll see this weekend. Both teams lean heavily on their top players, and it should make for exciting viewing watching their studs go toe-to-toe. Who gets the Vandenburg matchup for Georgia? Does Harvard stick John Stubbs on Georgia’s breakout sophomore Nathan Haskell? Tune in and find out. 5:00 PM: UNC v. Pitt — Saturday’s marquee match up, and one that both teams should be fired up for as it will likely determine the top spot in Pool A. Pittsburgh enjoyed great success at Stanford running pull plays that allowed them to score in only a few throws. Carolina is a team that knows how to disrupt throwing lanes and muck up pull plays better than almost any in the country, so seeing how Pitt tries to solve the Carolina defense will be fascinating. In the spirit of the March Madness, no doubt Hastings and UNC will be looking to bust some brackets and take down the number one seed. Comments on "Easterns 2016: Tournament Preview (Men’s)"